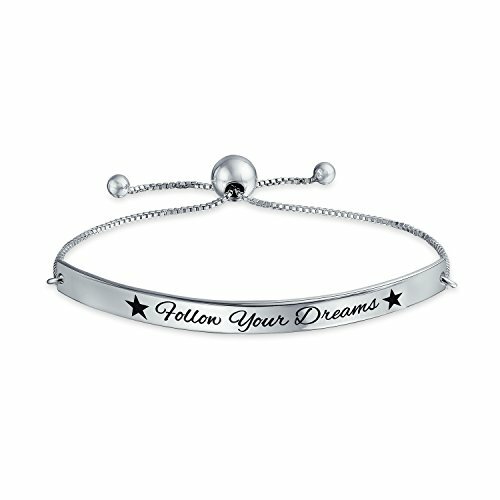 Inspiration is at its best with our sterling silver adjustable Follow Your Dreams bolo bar bracelet. This sterling silver adjustable bolo bracelet makes a perfect gift for any loved one featuring an inspirational message to follow your dreams. BEAUTIFUL DESIGN - This enchanting, sterling silver bracelet will give you a burst of inspiration and add zest to any style. Featuring the words, Follow Your Dreams with an adjustable, bolo design, it makes a charming gift for a loved one. COMPOSED OF 925 SILVER - High quality material that will stand the test of time.